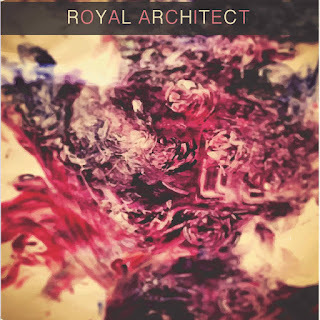 Royal Architect released their debut Et In Arcadia Ego in August last year. The band is led by Matthew Graboski (guitars/pianos/vocalist). His musical history runs deep with the band OHO, who have several releases to their credit. While OHO is hailed as Baltimore's answer to Pink Floyd on the band's website, the latest band has yet to form an identity. Jason Butcher (drums,vox), Ryan Finnerin (bass) and Tim Yungwirth (guitars, RTG, percussion) round out the band. Additional musicians include Denny Finnerin (vox), Kelly Butcher(vox) and Christopher Freeland (percussion). The title means the following: Et in Arcadia ego (also known as Les bergers d'Arcadie or The Arcadian Shepherds) is a 1637–38 painting by Nicolas Poussin (1594–1665). It depicts a pastoral scene with idealized shepherds from classical antiquity clustering around an austere tomb. Matthew Explains: I took the title from the book Blood Meridian. The phrase is engraved on the main antagonist's rifle and is a reference to a specific notion "even in your paradise I (death) am near. This character fashions himself a regular harbinger of death. So right out the gate, the album becomes a cerebral entity with the title and names of the songs. But that is ok with me, I had something to learn. The bonus is the band sent me the high-quality vinyl pressing of the album. This was greatly appreciated as I have been amassing vinyl at an alarming rate the past few years. It seems many others have as well around the world and that is a good thing for bands and music business overall. Graboski reminded me of Widespread Panic's John Bell. That is a compliment from where I sit as I think they are an amazing band. His vocals have that whiskey soaked vocal style that you hear in the blues quite often. There is one big difference however, this is progressive rock. The music comes at you fast. It is very interesting, and at times complex and I know it must be difficult to play by any stretch. Most notably I found the guitar playing at very high level consistent throughout the listen. It is definitely progressive as the opener "Draco Volans," another word I was unfamiliar with, sets the pace. In case you were interested, Draco Volans is the common flying dragon, a species of lizard prevalent in Southeast Asia. Its skin allows it to fly very similarly to the flying squirrel. So, needless to say, I have some interesting thoughts going through my head at this point. I listened to the album first before venturing into the unknown so I am not sure if any of that information would have made more sense to me if I had the knowledge prior to listening. None of that matters to me because what I heard I really enjoyed. This is very good music. I heard elements of many genres swirling around Graboski's vocals including blues, rock, and jazz. It is comparable to having a full course meal then sprinkling pepper all over each dish to give it that extra flavor, in this case, oomph. The word eclectic is appropriate when discussing the output of Royal Architect. "This Cloak," which clocks in at 6:33, leads off the B side of LP. It clearly defines what prog rock is all about. It is a variable kaleidoscope of sounds. After hearing that one track I see where this band can develop further and reach new heights. If you are wondering about the colorful cool cover? The artist is Graboski's 3-year-old daughter Delilah. I guess you have to start them young and provide encouragement. Talent for the arts is either in the genes or it isn't. It looks like this young lady is off to a good start with her color schemes. There is a lot of good music on this album to digest. It is never cut and dried due to the variances in pace and instrumentation. That is a good thing in my estimation if you are attempting, and this case succeeding, to record something progressive and ultimately different. Et In Arcadia Ego is a solid and consistent rocking group of songs. This band should be very encouraged to get in the studio and record again soon.